Integrators may want to keep adhesives like hot glue and double-stick mounting tape in their trucks to use when more traditional tools won't cut it. Hot glue tip: Improve adhesion on hard surfaces by rubbing lightly with sandpaper. Who said that you can’t teach an old dog new tricks? Well I’m here to prove them wrong. Many years ago when I had my alarm company, I ran across a competitor trying to put in alarm systems faster with the use of hot glue for securing cabling to molding and corners around a store. To me it looked sloppy and tacky (pardon the pun) and I ignored the practice. Moving forward to the present, I recently had a conversation with some techs who brought up the subject of installing with hot glue. Some commented how they have found certain situations where hot glue came in handy. One in particular was mounting equipment and running cable under desks and counters so as not to damage the furniture. This got me thinking again about hot glue, and some other adhesives we typically use in the trade to save time and still provide a professional job. Hot glue does a nice job in some applications: out-of-the-way places such as inside and under furniture for panic buttons; securing devices that do not have mounting holes; mounting wireless devices where you do not want to do any drilling or screwing; quickly and securely mounting devices in cabinets so as not to puncture the cabinet. Some hot-glue operating tips: If mounting upside down, first place hot glue on the device to be installed, let sit for a few seconds and then flip and press device in place, and then hold for 30 seconds. Extra adhesion on hard surfaces can be accomplished by rubbing lightly with sandpaper. DO NOT tip the glue gun upside down or lay it on its side when hot. DO NOT pull the hot stick out of the gun when done. Hot glue often can be easily removed with isopropyl alcohol. It will soften and then pull off easily. Many techs have raved about the use of Gorilla hot glue sticks. Let’s move on to double-stick mounting tape. Once, upon reviewing a residential installation, I noticed an RJ31X jack hanging from one of the floor joists. The supplied double-stick tape on the jack was obviously not a good match for rough wood. However, many are supplied with double tape. Author Bob Dolf, "Tech Talk" columnist for Security Sales & Integration, will be presenting at ISC West 2019 in Las Vegas. His presentation, “50 Tools in 50 Minutes,” will highlight 50 of the best Tool-of the-Month selections from 200+ Tech Talk columns over the past 17 years. Thursday, April 11, 11:00 a.m.
Not the best choice on raw wood; a small screw or even a quick staple would have been better in this case. Know your limitation of using double-stick mounting tape. The No. 1 rule: Thoroughly clean the surface you are sticking the sensor to. Sounds simple, but it’s often overlooked. If you are sticking wireless devices to cold windows and door frames make sure the condensation is dried up as it will affect proper adhesion to the devices. Double-stick tape can also be easily removed with a little finesse. There are many claimed methods from lifting small residue with sticky packing tape, using WD-40, even Zippo lighter fluid. I will leave it up to you to find your preferred method. For temporary alarm sensor installations, you may want to consider the little marvel from 3M called Command strips. The tape provides a good adhesive bond and can also be removed easily by pulling on special release tabs. Tip: When mounting sensors in corners or close spaces make sure to have enough room to pull out the release tab about six inches. 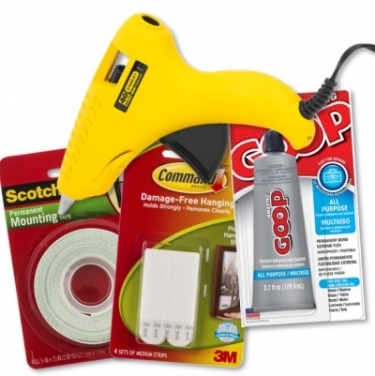 Another quality adhesive that was always in my toolbox was GOOP, made by a Eugene, Ore.-based company, Eclectic Products. It is an extremely flexible permanent bonding agent, and can be used to repair and mount anything. Remember, though, it’s permanent so be careful and certain where and how you are applying it. Adhesive products have a definite niche spot in any technician’s truck. Learn to take advantage of these handy products and see what works best for you. Bob Dolph is currently a Security Sales & Integration "Tech Talk" columnist and a contributing technical writer. View Bob Christensen's complete profile.